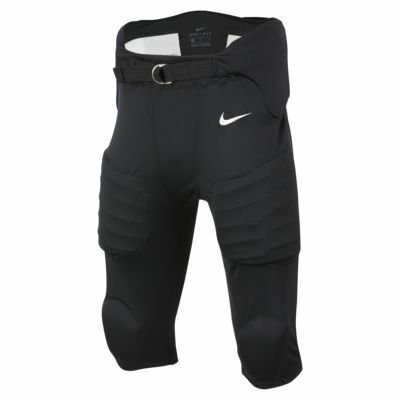 The Nike Recruit 3.0 Big Kids' (Boys') Football Pants are designed with tough foam padding in key areas to help protect against impacts on the field. Elastic cuffs and stretch fabric provide snug-fitting comfort during practice and games. The Nike Recruit 3.0 Big Kids&apos; (Boys&apos;) Football Pants are designed with tough foam padding in key areas to help protect against impacts on the field. Elastic cuffs and stretch fabric provide snug-fitting comfort during practice and games. Fabric: Body/center front lining/center back lining: 100% polyester. Pads: 100% ethylene vinyl acetate.